Lawmakers have recently begun proposing different policy options that would change the U.S. tax system—ranging from wealth taxes to higher marginal income tax rates to increasing the estate tax. When discussing changes like these, it’s important to understand the composition of taxes under the current system. Using data from the Office of Management and Budget, we can look at how the composition of federal revenue has changed over time. 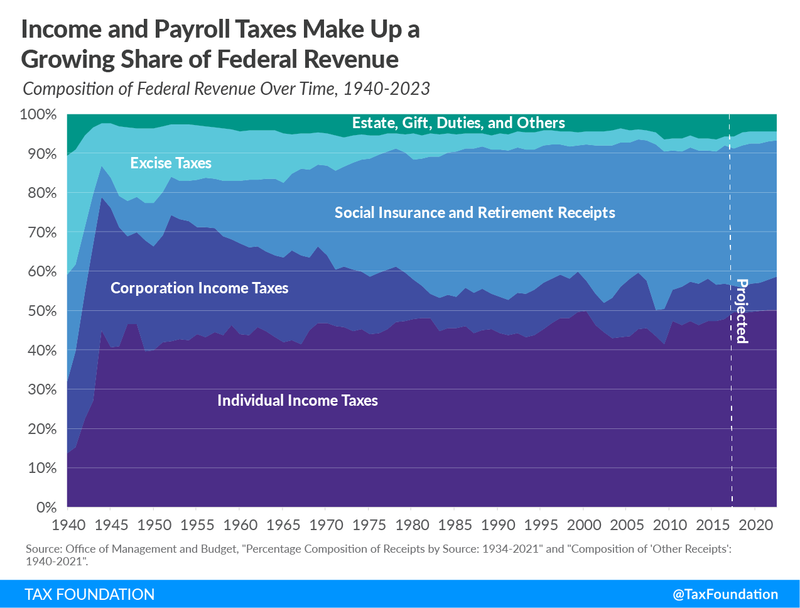 Several trends stand out: the increasing significance of both individual income taxes and payroll taxes as well as the decreasing significance of corporate income taxes and excise taxes. But before pointing to these trends as proof for the need to raise taxes on a certain group of taxpayers, it’s crucial to know some of the underlying information. Before 1941, excise taxes, such as gas and tobacco taxes, were the largest source of revenue for the federal government, comprising nearly one-third of government revenue in 1940. Excise taxes were followed by payroll taxes and then corporate income taxes. Today, payroll taxes remain the second largest source of revenue. However, other sources have shifted in relative importance. Specifically, individual income taxes have become a central pillar of the federal revenue system, now comprising nearly half of all revenue. Following an opposite trend, corporate income and excise taxes have decreased relative to other sources. Several policy changes contributed to these trends. For example, the growth in payroll taxes as a source of revenue reflects the implementation and expansion of Social Security and Medicare. One factor explaining the changes in individual and corporate income taxes is that more business income is now taxed under the individual income tax rather than the corporate income tax. The majority of companies in the United States are pass-through businesses and are not subject to the corporate income tax; they therefore pay individual income taxes instead. Past decisions to change the tax code, such as creating payroll taxes or new forms of organizations, have led to changes in the composition of federal revenue. Awareness of these trends are important context for contemporary discussions of who pays taxes and how much. More than 140 countries worldwide – including all European countries – levy a Value-Added Tax (VAT) on purchases for consumption. 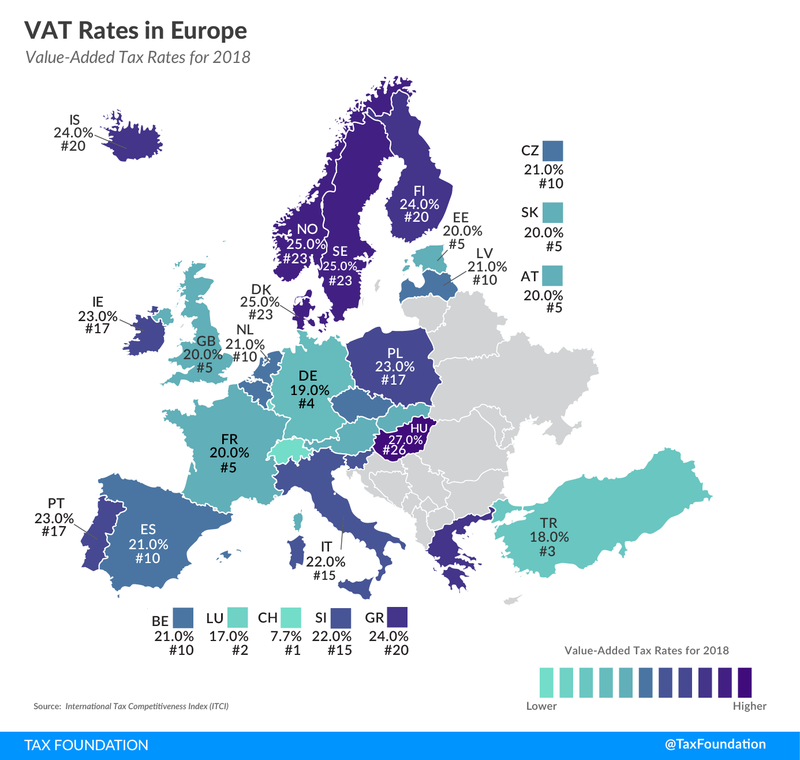 As today’s tax map shows, although harmonized to some extent by the European Union (EU), Europe’s VAT rates vary moderately across countries. The VAT is a consumption tax assessed on the value added to goods and services. The final VAT levied on a good or service is the sum of the VAT paid at each production stage. While VAT-registered businesses can deduct all the tax already paid in the preceding production stages, the end consumer does not receive a credit for the VAT paid, making it a tax on final consumption. The potential for easy administration, significant tax revenue, and few economic distortions make the VAT one of the most efficient forms of taxation. In contrast, some other forms of taxation, such as income and corporate taxes, impede economic activity and can distort decisions between consumption and investment. According to EU law, EU Member States are required to levy a standard VAT rate of at least 15 percent and a reduced rate of at least 5 percent. Switzerland, as a non-EU country, levies the lowest VAT rate of only 7.7 percent, followed by Luxembourg (17 percent), Turkey (18 percent), and Germany (19 percent). The countries with the highest VAT rates are Hungary (27 percent), and Sweden, Norway, and Denmark (all at 25 percent). The average VAT rate of the European countries covered is 21.3 percent. Most European countries set thresholds for their VATs. 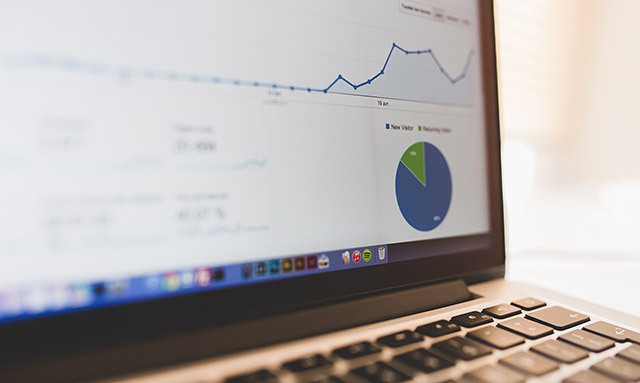 This means that a business’s revenue of taxable goods and services must be above a certain value before it is required to register and pay a VAT on its products. This registration threshold allows small businesses to save time and expenses in compliance. However, it also discriminates against larger businesses, creating economic distortions. Registration thresholds identified in this table are general concessions that relieve domestic suppliers from the requirement to register for and/or to collect VAT until such time as they exceed the revenue threshold. Relief from collection and/or registration may be available to specific industries or types of traders (for example nonresident suppliers) under more detailed rules, or a specific industry or type of trader may be subject to more stringent registration and collection requirements. The thresholds of non-euro countries have been converted into euros for comparability by using the European Central Bank’s (ECB) 2018 exchange rates. In Spain and Turkey, all businesses, regardless of their revenue, are required to register and pay a VAT. On the other hand, French and Swiss businesses are only exempt from VAT registration if their revenues stay below considerably high thresholds of € 82,200 and € 86,580, respectively. Apart from VAT rates and thresholds, the VAT base also significantly impacts the effectiveness and efficiency of a VAT. 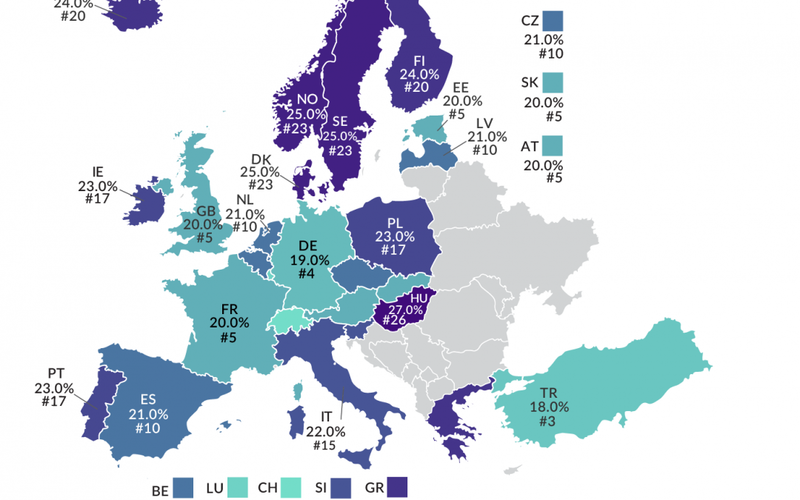 A future map will show how European countries rank on a measure of their VAT base. Forty-four states levy a corporate income tax. Rates range from 2.5 percent in North Carolina to 12 percent in Iowa. 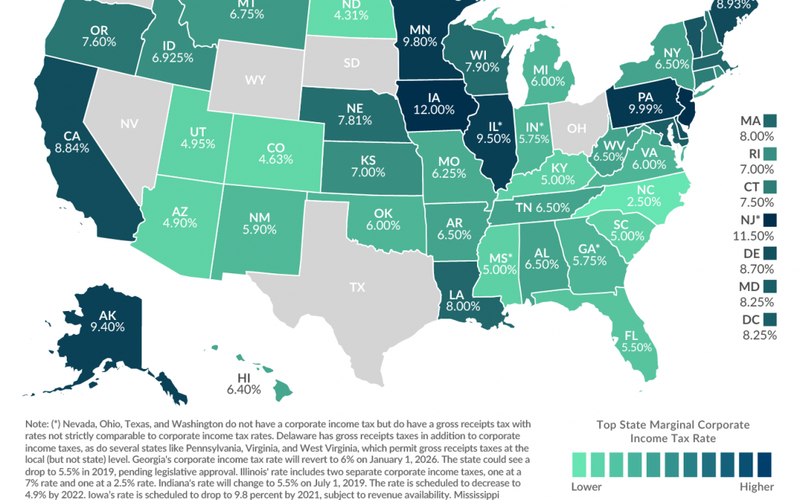 Six states—Alaska, Illinois, Iowa, Minnesota, New Jersey, and Pennsylvania—levy top marginal corporate income tax rates of 9 percent or higher. Eight states—Arizona, Colorado, Kentucky, Mississippi, North Carolina, North Dakota, South Carolina, and Utah—have top rates at or below 5 percent. Nevada, Ohio, Texas, and Washington impose gross receipts taxes instead of corporate income taxes. Gross receipts taxes are generally thought to be more economically harmful than corporate income taxes. South Dakota and Wyoming are the only states that do not levy a corporate income or gross receipts tax. Corporate income taxes are levied in 44 states. Though often thought of as a major tax type, corporate income taxes account for an average of just 3.38 percent of state tax collections and 2.24 percent of state general revenue. Iowa levies the highest top statutory corporate tax rate at 12 percent, followed by New Jersey (11.5 percent), Pennsylvania (9.99 percent), and Minnesota (9.8 percent). Two other states (Alaska and Illinois) levy rates of 9 percent or higher. Conversely, North Carolina’s flat rate of 2.5 percent is the lowest in the country, followed by rates in North Dakota (4.31 percent) and Colorado (4.63 percent). Four other states impose rates at or below 5 percent: Arizona (4.9 percent), Utah (4.95 percent), and Kentucky, Mississippi, and South Carolina (5 percent). Nevada, Ohio, Texas, and Washington forgo corporate income taxes but instead impose gross receipts taxes on businesses, generally thought to be more economically harmful due to tax pyramiding and nontransparency. Delaware imposes gross receipts taxes in addition to corporate income taxes, as do several states, like Pennsylvania, Virginia, and West Virginia, which permit gross receipts taxes at the local (but not state) level. South Dakota and Wyoming levy neither corporate income nor gross receipts taxes. Graduated corporate rates are inequitable—that is, the size of a corporation bears no necessary relation to the income levels of the owners. Indeed, low-income corporations may be owned by individuals with high incomes, and high-income corporations may be owned by individuals with low incomes. A single-rate system minimizes the incentive for firms to engage in economically wasteful tax planning to mitigate the damage of higher marginal tax rates that some states levy as taxable income rises. Connecticut reduced its surtax in 2018 for corporations with more than $100 million in gross income from 20 to 10 percent, and the surtax expired at the start of the 2019 tax year. Absent its reimposition during the 2019 legislative session, this brings the top marginal rate down to 7.50 percent. Georgia lowered its top corporate income tax rate from 6 percent to 5.75 percent and doubled the standard deduction. A further reduction to 5.5 percent is scheduled for 2020, subject to legislative reaffirmation. Idaho decreased its rate from 7.4 percent to 6.925 percent. Mississippi continued phasing out its 3 percent corporate income tax bracket by exempting the first $2,000 of income this year. The 4 and 5 percent brackets remain in place. Indiana’s rate decreased to 5.75 percent on July 1, 2018, and a further reduction to 5.5 percent is scheduled for July 1, 2019. New Hampshire’s rate dropped to 7.7 percent from 8.2 percent. New Jersey added a temporary surcharge for businesses with income of over $1 million, bringing its top tax rate to 11.5 percent. As North Carolina continued to meet revenue goals, the state reduced its lowest rate in the nation from 3 percent to 2.5 percent. Utah shaved its corporate rate to 4.95 from 5 percent in March 2018. (a) Nevada, Ohio, Texas, and Washington do not have a corporate income tax but do have a gross receipts tax with rates not strictly comparable to corporate income tax rates. Delaware has gross receipts taxes in addition to corporate income taxes, as do several states like Pennsylvania, Virginia, and West Virginia, which permit gross receipts taxes at the local (but not state) level. (b) Georgia’s corporate income tax rate will revert to 6% on January 1, 2026. The state could see a drop to 5.5% in 2019, pending legislative approval. (c) Illinois’ rate includes two separate corporate income taxes, one at a 7% rate and one at a 2.5% rate. (d) Indiana’s rate will change to 5.5% on July 1, 2019. The rate is scheduled to decrease to 4.9% by 2022. (e) Iowa’s rate is scheduled to drop to 9.8 percent by 2021, subject to revenue availability. (f) Mississippi continues to phase out the 3 percent bracket by increasing the exemption by $1,000 a year. By the start of 2022, the 3 percent bracket will be fully eliminated. (g) Potential reform in 2020 will subject nearly all Missouri companies to a single sales factor appointment, permitting a rate reduction from 6.25% to 4%. (h) In New Jersey, the rates indicated apply to a corporation’s entire net income rather than just income over the threshold. A temporary surcharge is in effect, bringing the rate to 11.5 percent for businesses with income over $1 million. Note: In addition to regular income taxes, many states impose other taxes on corporations such as gross receipts taxes and franchise taxes. Some states also impose an alternative minimum tax and special rates on financial institutions. “2016 State & Local Government Finance Historical Datasets and Tables,” U.S. Census Bureau, https://www.census.gov/data/datasets/2016/econ/local/public-use-datasets.html. 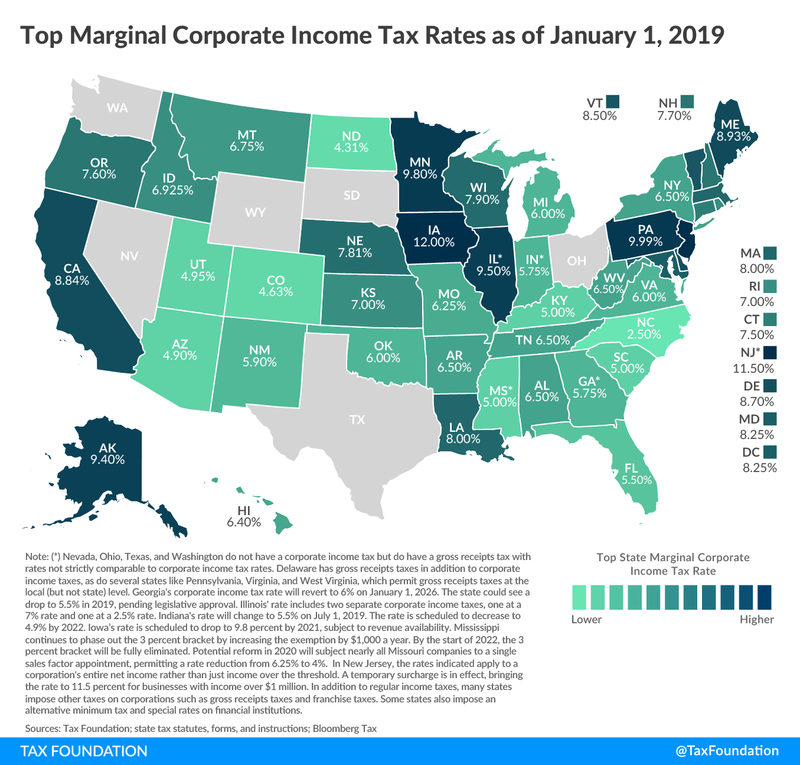 Although Iowa has the highest top marginal corporate income tax in the nation, its rates are not directly comparable with those of other states because the state provides a deduction for federal taxes paid. Iowa’s rate is scheduled to drop to 9.8 percent by 2021, subject to revenue availability. Justin Ross, “Gross Receipts Taxes: Theory and Recent Evidence,” Tax Foundation, Oct. 6, 2016, https://taxfoundation.org/gross-receipts-taxes-theory-and-recent-evidence/. Jeffrey L. Kwall, “The Repeal of Graduated Corporate Tax Rates,” Tax Notes, June 27, 2011, 1395. Katherine Loughead, “Five States Accomplish Meaningful Tax Reform in the Wake of the Tax Cuts and Jobs Act,” Tax Foundation, July 23, 2018, https://taxfoundation.org/five-states-accomplish-meaningful-tax-reform-wake-tax-cuts-jobs-act/. “Tax Reform,” Idaho State Tax Commission, June 21, 2018, https://tax.idaho.gov/i-2019.cfm. Scott Drenkard, “Indiana’s 2014 Tax Package Continues State’s Pattern of Year-Over-Year Improvements,” Tax Foundation, April 7, 2014, https://taxfoundation.org/indiana-s-2014-tax-package-continues-state-s-pattern-year-over-year-improvements/. Jared Walczak, “Tax Changes Taking Effect January 1, 2019,” Tax Foundation, Dec. 27, 2018, https://taxfoundation.org/state-tax-changes-january-2019/. Tax Policy – Who Shoulders the Burden of Federal Income Taxes? As we think about tax policy proposals designed to target specific or narrow groups of individuals, it’s important to understand who shoulders the burden of income taxes under the current system. 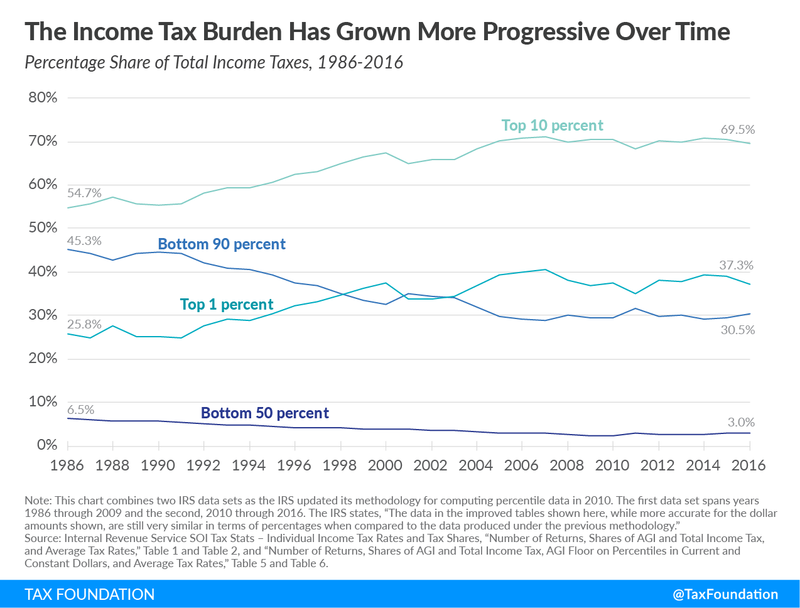 The federal income tax system is already progressive, with high-income taxpayers paying a larger share of the tax burden under higher average tax rates than lower- and middle-income taxpayers. Data from the Internal Revenue Service (IRS) shows us who pays federal income taxes. 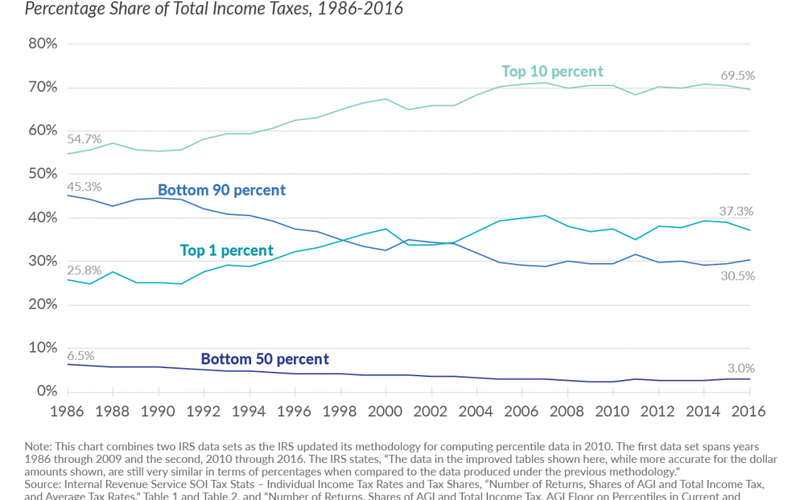 As illustrated below, higher-income taxpayers are responsible for paying a significantly higher share of the tax, and this trend has increased over the past three decades. For instance, in 2016, the top 1 percent of taxpayers paid about 37 percent of federal income taxes, more than twelve times the tax burden of the bottom half of taxpayers. We see a similar trend when looking at other income percentiles. The bottom 90 percent of taxpayers accounted for about 45 percent of the overall tax burden in 1986, compared to approximately 31 percent in 2016. Conversely, the top 10 percent of taxpayers have seen an increase in their tax burden over the same period, from 55 percent of total income taxes in 1986 to almost 70 percent in 2016. Average tax rates, which are income tax liabilities divided by income, are another way to illustrate the current tax system. 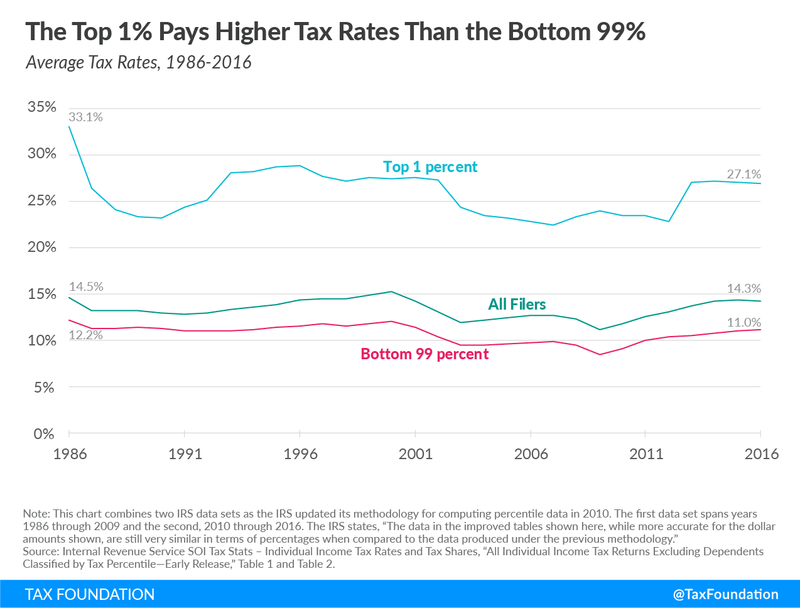 Using IRS data, we see that the top 1 percent of taxpayers paid a rate much higher than the average taxpayer, while the remaining 99 percent of taxpayers paid below the average rate. The top 1 percent paid an average federal income tax rate that was nearly 2.5 times higher than the rate paid by all other taxpayers. The current tax system also contains a variety of deductions, exclusions, and tax credits, which people can mistakenly believe only benefit the wealthy. Using data from the Joint Committee on Taxation, we can look at average tax rates and see that the progressivity of the tax system remains even after accounting for deductions and credits. In fact, many of these provisions result in lower-income households having zero or even negative tax liability because they receive refundable credits from the IRS. In 2017, the projected average tax rate for all taxpayers was 10.3 percent, and this was projected to decrease to 9.2 percent for 2018. This decrease is largely due to the Tax Cuts and Jobs Act, under which 80 percent of filers will see a lower tax liability in 2018, with another 15 percent having no material change. 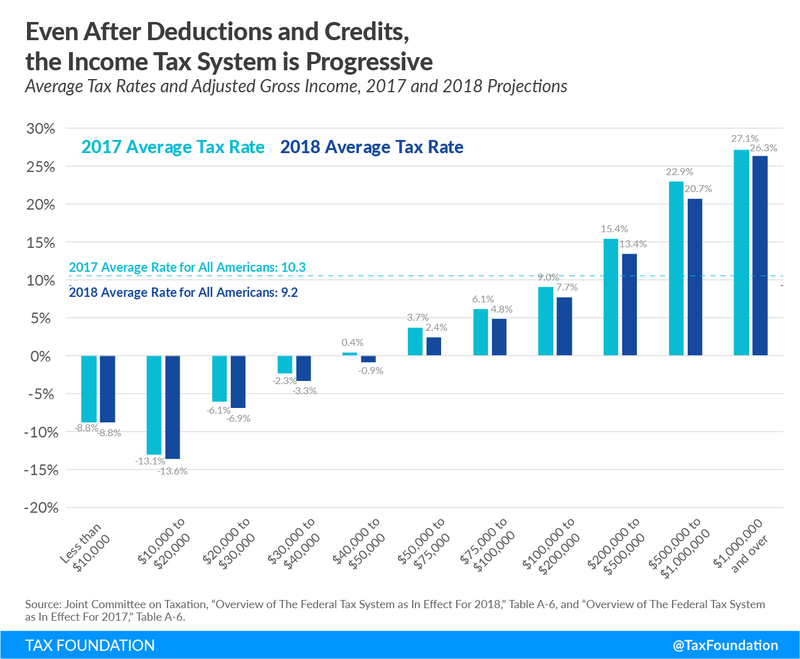 Notably, the Joint Committee on Taxation projects that average tax rates will decrease across the income spectrum—not a single income group is projected to see an average tax increase. Taxpayers with adjusted gross incomes of $50,000 and below are projected to have a negative tax liability on average in 2018. Tax policy proposals should be supported by a thorough understanding of the tax system, both as it exists today and has in the past. Proposals that would move away from today’s broad-based, low-rate income tax system toward further raising taxes on narrow bases of high-income taxpayers fall short of sound tax policy. 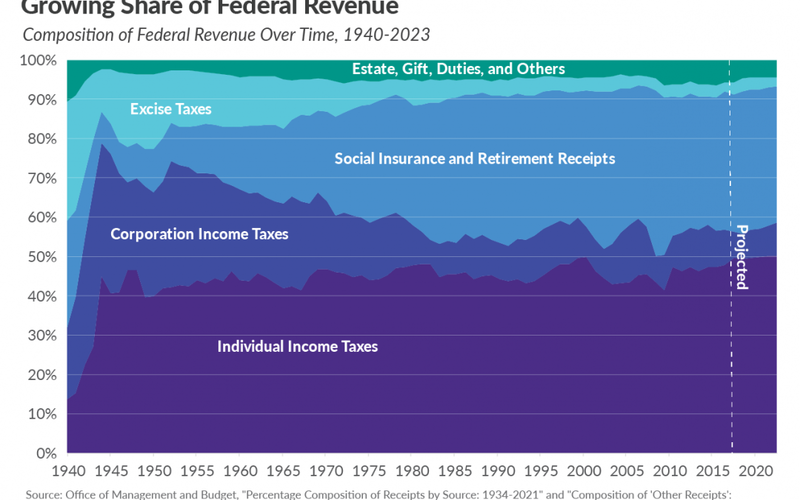 It is essential to consider what these charts reflect: the current federal tax system is already progressive and higher-income taxpayers shoulder a majority of the tax burden and pay considerably higher average tax rates than that of lower- and middle-income individuals. Source: Tax Policy – Who Shoulders the Burden of Federal Income Taxes? Over the past month, Oregon’s Joint Committee on Student Success Subcommittee on Revenue has been evaluating options to provide additional revenue for Oregon’s public education system. The committee hopes to raise about $2 billion to help cover Oregon’s structural budget deficit and has heard testimony from the Oregon business community, a coalition of business and labor groups, and the Legislative Revenue Office (LRO) on potential sources of tax revenue. Among the options to raise revenue is a gross receipts tax modeled after Ohio’s Commercial Activity Tax (CAT) or Washington’s Business & Occupation (B&O) tax, both of which are levied on business receipts without deductions for a firm’s costs. This revives a discussion in the state about the appropriateness and economic effects of taxing gross receipts. Two previous proposals to enact a gross receipts tax in Oregon failed, including a legislative proposal in 2017 and a ballot initiative to enact a gross receipts tax in 2016 that was rejected by voters 59.03 percent to 40.97 percent. The tax maintains or improves the state’s progressive tax structure. A gross receipts tax fails several of these principles. Gross receipts taxes may have low statutory rates, but they cause tax pyramiding when business inputs are not exempted from the tax, meaning their effective tax rates are much higher. Tax pyramiding occurs when the value from a good is taxed multiple times as it is bought and sold in the production process, inflating the effective tax rate. Gross receipts taxes have an overly-broad tax base; business inputs should be exempt from taxation. While it is important to have a tax with a broad base and a low rate, Oregon also needs a right-sized tax base, not the broadest tax base possible. A tax on gross receipts would not provide neutral tax treatment across different firms. Gross receipts taxes disproportionately impact firms with low profit margins and high transaction volumes, such as startup firms, manufacturers, and retailers. The amount of tax pyramiding differs by industry, as industries have varying production lengths. For example, a study of Washington’s B&O tax found that pyramiding varies from 1.4 times to 6.7 times, depending on the industry. This results in varying effective tax rates for firms and industries, distorting economic behavior and slowing growth. Finally, gross receipts taxes are regressive. Consumers bear the brunt of the tax as businesses raise prices in response. Lower-income Oregonians spend more of their income on goods that increase in price than higher-income Oregonians do. The LRO found that the gross receipts tax proposed by Measure 97 in 2016 would reduce after-tax household income for low-income earners by -0.9 percent, while the highest of earners would only see a -0.4 percent decline in their household income. A proposal to exempt essentials such as groceries, fuel, utilities, and some health care may help limit regressivity but would not eliminate it, while introducing economic distortions by providing carveouts to certain industries. The committee is also considering a proposed Business Activity Tax, which would only by levied on the value added by a business, with business inputs and capital purchases exempted. This proposal resembles New Hampshire’s VAT-like Business Enterprise Tax (BET) and would not suffer from tax pyramiding as the economic value of goods would only be taxed once. This proposal is more promising than a gross receipts but at this early stage lacks key details such as the tax rate and how to administer a tax with few antecedents at the state level. Layered on top of the conversation about revenue sources is a disagreement over whether to include changes to Oregon’s Public Employees Retirement System (PERS) as part of a broader reform package. PERS is responsible for much of Oregon’s structural budget deficit, but some groups such as the Coalition for the Common Good argue that reforming PERS should be a separate conversation. We will monitor these proposals and provide analysis on developments in Oregon as revenue options take shape.